If you're one of the many IT professionals who has stopped by our booth at a tradeshow, you know that we can talk all day about PrinterLogic. It's hard not to. There are so many proven benefits to implementing our print management solution—ease of use, security, ongoing cost savings, more efficient management, satisfied end-users and admins (to name only a few)—that it takes time to convey exactly how quickly and profoundly PrinterLogic can transform your print environment for the better. Of course, we know we've got an uphill battle. Print servers have been the default print management solution for so long that many organizations have simply learned to suffer with their shortcomings. When we tell them that PrinterLogic is truly easy to deploy, really does empower end-users with an intuitive self-service portal, and actually makes print management effortless, we're working against decades of negative experience that says enterprise printing will never be anything but an expensive headache. So maybe it's time for us to take a step back and let our customers do the talking. For a while now the independent research firm TechValidate has been conducting unbiased anonymous surveys with verified PrinterLogic customers from all backgrounds. Some are small businesses. Some are large enterprises. Some operate in the field of construction. Others are involved in education, retail, financial services, government or utilities. Some have only one site, whereas others are distributed regionally or even globally. The one thing they all have in common is that they've deliberately chosen PrinterLogic as their print management solution, often migrating away from flawed traditional solutions like print servers. For every one of those features, between 92% and 99% of the respondents rated PrinterLogic as "Great" or better. When it came to ease of use, nearly nine out of ten respondents rated PrinterLogic as "Excellent" or better—with more than half of that group awarding it the survey's top rating of "Amazing." PrinterLogic's speed of deployment earned similar marks: 87% of the respondents categorized it as "Excellent" or better. Not only did they state that PrinterLogic's deployment was fast, they also said it was incredibly easy. 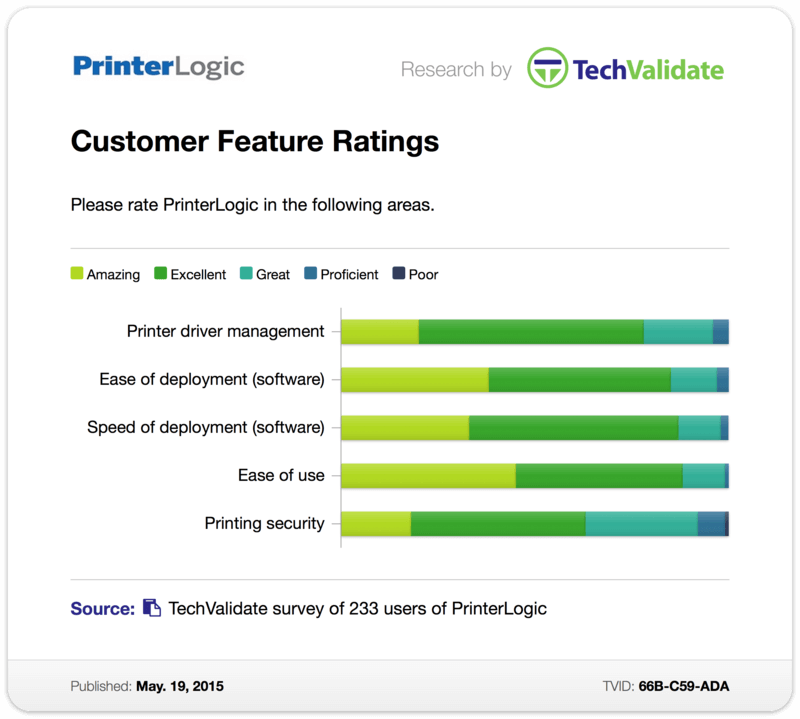 A full 85% of the respondents rated PrinterLogic's ease of deployment as "Excellent" or higher, with a substantial portion of that percentage saying it was "Amazing." And printer driver management? PrinterLogic naturally scored well there too. Well over three-quarters of those surveyed rated PrinterLogic as "Amazing" or "Excellent." In terms of printing security, PrinterLogic wowed 63% of the respondents, who reported their experience as "Excellent" or better. An additional 29% called it "Great." All these organizations—regardless of sector, regardless of size—now have a very different opinion of enterprise printing thanks to PrinterLogic. Our print management solution is the proof that you can regain control of your print environment quickly, reliably, easily and securely. But you don't have to take our word for it. Our customers will be happy to tell you themselves.